In this novel of family and redemption, a mother struggles to save her eighteen-year-old daughter from the devastating consequences of mental illness by forcing her to deal with her bipolar disorder. New York Times best-selling author Bebe Moore Campbell draws on her own powerful emotions and African-American roots, showcasing her best writing yet. Trina suffers from bipolar disorder, making her paranoid, wild, and violent. Watching her child turn into a bizarre stranger, Keri searches for assistance through normal channels. 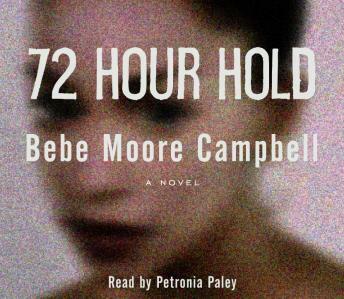 She quickly learns that a seventy-two hour hold is the only help you can get when an adult child starts to spiral out of control. After three days, Trina can sign herself out of any program. Fed up with the bureaucracy of the mental health community and determined to save her daughter by any means necessary, Keri signs on for an illegal intervention. The Program is a group of radicals who eschew the psychiatric system and model themselves after the Underground Railroad. When Keri puts her daughter’s fate in their hands, she begins a journey that has her calling on the spirit of Harriet Tubman for courage. In the upheaval that follows, she is forced to confront a past that refuses to stay buried, even as she battles to secure a future for her child. Bebe Moore Campbell’s moving story is for anyone who has ever faced insurmountable obstacles and prayed for a happy ending, only to discover she’d have to reach deep within herself to fight for it. I enjoyed the book, I have a new understanding for those who suffer from mental illness as well as their families. The book described the action in great detail. A great read.. The book was well written, but I am sure I missed a great deal in reading the abridged version. The author clearly shows a picture of a family struggling with mental illness, and that is not an easy task to complete. The book started off really good but then lost it's steam. I felt like something was missing. The book did however show how mental illness can destroy a family. I can't imagine what it would be like to have to go through all the heartbreak and disappointment to try and obtain help and protection for my loved one. I did enjoy the book, and wish it had been unabridged. I felt like some parts were not clear....and some of the characters' motivations were fuzzy. However, the book was so well written as a whole, I am inclined to thing that the "fog" can be attributed to a poor abridgment.